How Much Can You Make in an Early Childhood Education Career? What Courses Can be Taken for an Online Early Childhood Education Degree? Early childhood educators prepare young children to succeed in kindergarten classrooms by leading activities that promote children’s mental, social, and emotional development. Additionally, the Bureau of Labor Statistics (BLS) projects the number of preschool teachers will grow by 10% between 2016 and 2026, outpacing the median growth for all positions in the U.S. Many of the higher paying careers for early childhood education majors, such as kindergarten teachers, typically require a bachelor’s degree. Future preschool teachers, kindergarten teachers, and childcare workers can choose from many options when it comes to earning their degree, including online programs. Online programming offers increased flexibility for students who work full or part time, and earning an online bachelor’s degree can lead to new job opportunities and teacher licensure. The following sections cover many important topics related to enrolling in an early childhood education bachelor’s degree online, including the best online programs in the U.S., common coursework, scholarship opportunities, and potential careers. 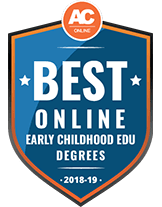 This section discusses the best online bachelor’s degrees in early childhood education for the 2018 academic year. Many criteria were considered when developing this list, such as a program’s graduation rate, cost and tuition, and availability of online courses. Rankings rely on official statistics obtained from the Integrated Postsecondary Education Data System. Liberty University's Bachelor of Science in early childhood education is offered in a 100% online format. Students have the option, however, of including a field experience capstone course. If they choose to do so, they'll gain hands-on experience and will be able to pursue certification through the Association of Christian Schools International (ACSI). Graduates interested in pursuing careers as teachers can continue on to earn a Master of Arts degree in teaching; this degree is required to obtain teaching licensure. Liberty University is a private, Christian-affiliated institution with its main campus in Lynchburg, Virginia. The Bachelor of Science in early childhood education offered by the University of Montana Western is a hybrid program combining online coursework with in-person field experience. Successful completion of 120 credit hours is required to earn this degree, including 70 credits related specifically to the major subject. Students can pursue an area of emphasis and have a dozen options from which to choose. Degree requirements also include completion of a practicum consisting of supervised field experience in the student's area of emphasis. Example career options for graduates of this program include early childhood teacher, early childhood program administrator, parent educator and early childhood trainer. South Dakota State University's Bachelor of Science in Early Education and Care is a hybrid program that combines online courses and in-class observation and evaluation experiences. The program is offered through the Great Plains Interactive Distance Education Alliance, or Great Plains IDEA, a partnership of 20 public universities that gives students access to online courses from a wide range of partner institutions. The degree can qualify graduates to work in a variety of early childhood education settings, such as child care homes and centers, Head Start programs, infant/toddler and pre-school programs and before- and after-school programs for children ages 8 and younger. 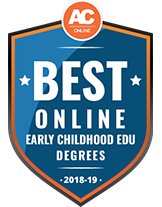 For students interested in earning their degrees online and working in the field of early childhood education, Bemidji offers a Bachelor of Science in elementary education. The degree program is available in a hybrid format, combining online courses with 3 face-to-face meetings in the Minneapolis metro area. An associate degree or completed MN transfer curriculum with a cumulative 3.0 GPA is required for admission. Bemidji's elementary education bachelor's degree prepares graduates for careers in a range of early-childhood-education-related positions, including preschool and kindergarten or elementary school. Mayville State University offers two early childhood education-focused bachelor's degrees that can be earned partially through online study. Mayville's Bachelor of Science Education in early childhood education degree is a composite of both early childhood education and elementary education and qualifies graduates to apply for birth-through-3rd-grade teacher licensure. Mayville's Bachelor of Arts in early childhood degree is designed to prepare students to work in a number of early childhood education-related leadership occupations, including preschool teachers, administrators, curriculum specialists and more. Both degrees feature a combination of online coursework and in-person activities (field experiences, internships, student teaching). The online Bachelor of Applied Science in early childhood education offered by Northern Arizona University is a blended online/in-person degree-completion program designed for individuals who have previously earned associate degrees from community colleges and wish to expand their knowledge and skills in early childhood education. Students must complete 120 total credit units, which include 64 units in an associate degree transfer block (75 units accepted from Arizona community colleges), and 21 units in specialized early childhood education coursework. This degree does not lead to teacher certification, but graduates should be able to pursue career opportunities with preschools, state agencies, nonprofit organizations and other similar venues where specialized skills in early childhood education are utilized. The University of Nebraska Kearney's online Bachelor of Arts in early childhood inclusive program was created to allow assistants in preschools, in-house teachers, Head Start staff members and other students unable to attend regular classes on college campuses to earn their degrees and become eligible for their teaching certificates. The degree is offered in a hybrid format that combines online coursework with school-based experiences and student teaching. The degree takes 120 credit hours to complete and prepares students to work with children from birth to age 5 in special education or from birth to age 8 in regular education classrooms. Western Carolina University's birth to kindergarten (BK) program offers two distinct online bachelor's degree concentrations. The first option is a professional education concentration is designed for those interested in teaching in public school pre-K, North Carolina pre-K and/or kindergarten settings. Coursework is completed online and students are required to complete in-person internships. Internship placement is limited to North Carolina pre-K, Head Start and kindergarten classrooms. The second option is the early childhood concentration, which is geared to those students interested in working with young children and their families in settings other than public schools, as students are not certified to teach in these settings. Coursework is completed online for this concentration, but there is no internship requirement. Students must, however, complete 18 credit hours of action research, in which they must participate in person in an early childhood setting. An alternative licensure option is also available. This option allows students who have previously earned 4-year degrees to participate in internships and other experiences in order to qualify for teaching licensure. The University of Toledo's bachelor's degree in early childhood education is a non-licensure, degree-completion program that combines online coursework with field experiences. Students must have an associate degree in early childhood education or child development with a cumulative GPA of at least 2.7 to be admitted into this program. An applicant must also be employed at an early care or education program for a minimum of 20 hours per week. Graduates with this degree typically pursue early childhood education-related employment in support and administrative positions in schools, public and private agencies and similar organizations, or go on to pursue master's degrees in the field, leading to professional licensure and positions as preschool and kindergarten teachers. Judson College is a private, Baptist-affiliated, all women's college located in Marion, Georgia. Women interested in working with young children, including those at the preschool level and younger, may want to consider Judson College's online Bachelor of Science in elementary education. This hybrid degree-completion program combines online coursework with in-person field work experiences. Courses follow a cohort model, which requires students to start and complete classes on the same schedule as their on-campus counterparts. This degree prepares graduates for employment as teachers at the K-6 grade levels, but may also be applicable to early childhood education settings. Judson College certifies Alabama degree candidates only, and field experience and clinical practice observation placements for this degree program are made exclusively with Alabama schools. Your program, concentration, and location can all influence your future career and earning potential. When researching potential jobs and their accompanying salaries, keep in mind that your first job after graduation may pay a lower salary than many of the numbers you read online. Official salary numbers, such as those reported by the BLS, usually represent a median figure. However, earning a bachelor’s degree teaches important skills and provides educational experiences that typically lead to a higher starting salary compared to candidates who only hold an associate degree or high school diploma. The table below includes the salaries, projected job growth, and typical duties associated with five common careers held by graduates with a bachelor’s in early childhood education. Preschool teachers work at public and private schools. Their primary job duties include leading skill-building exercises to prepare children for kindergarten. They may also identify behavioral issues and learning disabilities, as well as meet with parents to recommend outside services, such as special education teachers. The highest paid preschool teachers typically hold both a bachelor’s degree and a state-issued teaching license. Childcare workers take care of small children below the ages of five or six, depending on when a child enters preschool or kindergarten. These workers promote children’s development by providing a safe environment where children can express their curiosity. Childcare workers may also feed and bathe children. Similar to preschool teachers, childcare workers who hold a bachelor’s degree typically earn higher salaries and may qualify for promotion. These professionals work at public and private elementary schools, teaching young children fundamental reading and math skills. They also expose children to science and social studies topics and introduce important academic skills, such as how to study and communicate with peers. Other job duties include ensuring that students enter and leave school safely. In most states, a bachelor’s in early childhood education qualifies graduates to pursue teacher licensure. In large classrooms with many students, teacher assistants help the primary teacher maintain discipline, answer questions, and help keep the classroom clean. They also assist teachers with recordkeeping tasks, such as taking attendance, grading papers, and organizing handouts. Early childhood education graduates can use a teacher assistant position as a stepping stone to a full-time kindergarten teacher position. Occupational therapy assistants and aides work with clients of all ages to develop independent living and mobility skills. These assistants and aides often help young children with physical and/or mental disabilities learn to socialize with their peers and develop better learning habits. Early childhood education majors interested in this career path can also earn a graduate-level degree and pursue work as an occupational therapist. The next section details salary and job growth information for preschool teachers in every state. Because each state’s population density, birth rate, and cost of living vary widely, different areas require a different number of preschool teachers, which impacts growth projections. As of May 2017, California, Texas, and New York employed the largest number of preschool teachers. New York also offers the highest salaries, with the District of Columbia and Connecticut coming in at second and third, respectively. Although the specific curriculum covered by students pursuing an online bachelor’s degree in early childhood education varies depending on the school, many programs emphasize a core curriculum that includes foundational teaching skills, subject-specific techniques, and social and behavioral sciences. If your program offers concentrations or minors, you can also select specialized electives to better match your career goals. The list below represents a mix of general and specialized courses commonly taken by students earning an early childhood education degree online. In this introductory course, students learn teaching basics and how to interact with and instruct young children. This course also stresses information relating to children’s biological and psychological development. Teachers at all levels must understand how to develop curricula that helps students learn to the best of their abilities. Specific course topics include how to take advantage of children’s natural curiosity when planning lessons. In this course, teachers learn how to keep their students healthy throughout the school year and promote healthy eating choices. Course topics include preventing the spread of sickness during flu and cold season. As children prepare to enter kindergarten, early childhood education teachers assess their readiness by observing their emotional, social, and mental development. This course stresses techniques teachers can use to help children overcome obstacles that might prevent them from succeeding in kindergarten and beyond. This course prepares teachers to spot atypical behavior in children, which might indicate either giftedness or a learning disability. Coursework addresses various academic characteristics and how to accommodate them in the classroom. To find the best early childhood education online program, consider your interests, career goals, and budget. The sample questions listed below can help with this process. Also, remember that the best way to find answers often involves contacting a program directly. A school’s education department or admissions office can provide detailed answers to your questions. What is the tuition for an early childhood education degree online program? Online bachelor’s programs charge different tuition rates, which vary depending on a school’s type (e.g., public vs. private) and a student’s residency status (in-state vs. out-of-state). However, many online programs charge all distance learners the same rate, regardless of where they live. Given the variable cost of tuition, you should spend ample time researching different programs to find one that meets your educational needs at a competitive price. How should my career goals influence which program I attend? Generally speaking, you can earn your early childhood education bachelor’s degree online through two different types of programs: licensure and nonlicensure programs. Undergraduates who plan to teach young children in public schools need to earn a teaching license in their state. If you decide to attend an online program that confers licensure, make sure that the program meets your state’s licensure requirements for early childhood education teachers. Alternatively, non-licensure programs prepare students to work at private daycare centers and similar facilities. Online learning features many benefits, such as increased flexibility. However, some students may find distance learning relatively impersonal, especially if they enjoy face-to-face instruction or learning in a group setting. However, thanks to technological advancements, most universities offer a host of useful resources to help students from all backgrounds succeed online. Once you decide that online learning meets your educational needs, you should review whether your computer and internet connection can handle your school’s technology requirements. How can I find out if an early childhood education career is right for me? Early childhood educators foster young children’s curiosity, social development, and academic skills to help them become active learners and productive members of society. To find out if this career path fits your interests and goals, consider volunteering at an organization — such as a daycare center — where adults interact with young children. To work or volunteer with children, you may need to pass a criminal background check, TB test, and/or drug screening. When researching bachelor’s in early childhood education programs, you may come across schools that offer a concentration in the Montessori Method. In the early 20th century, Dr. Maria Montessori proposed a revolutionary early childhood education method; this method stresses the relationship between child, teacher, and learning environment. Students studying to become Montessori teachers undergo intense training, learning to create optimal learning environments to encourage students’ self-discovery. This training helps sets them apart from other general education teachers. Many funding options exist that can help you pay for your online bachelor’s degree in early childhood education, including research scholarships and grants; these two types of aid do not require students to pay back money after graduation. Learners can also apply for loans, although these should only be considered as a last resort. Student loan debt negatively impacts millions of Americans’ professional and personal lives. To try and avoid debt, apply for many scholarships, including the award opportunities listed below. Undergraduates who join AMS can apply for exclusive annual scholarships. In 2018, 74 students in the U.S. studying Montessori education received scholarships totalling $71,200. Award amounts vary, and the application window opens each spring. The AMS scholarship committee considers two factors when awarding funds: financial need and a personal statement. Students can use this one-time scholarship to help pay for tuition or other education-related expenses, such as housing or books. Exclusive to students earning degrees in early childhood education, this scholarship program hands out awards of up to $1,000. Applicants must plan to work with children ages six and under and have already completed at least 30 semester hours of undergraduate coursework. Applicants submit a 500-to-800-word essay and transcripts that reflect a minimum 3.0 undergraduate GPA. Former Bright Horizons interns receive preference for these scholarships. Each year, the Alpha Kappa Educational Advancement Forum Foundation awards both merit-based and need-based scholarships to undergraduates in their sophomore, junior, or senior year. The merit-based scholarship requires applicants to possess a minimum 3.0 GPA and document community service hours. For need-based applicants, the minimum GPA requirement drops to 2.5. Need-based applicants also need to submit relevant financial information. This one-time scholarship is nonrenewable. PDK — a professional association for teachers — awards multiple scholarships to rising educators earning their bachelor’s degrees. Applicants must be members of PDK and submit transcripts, a statement of purpose, and descriptions of their extracurricular and volunteer activities. The scholarship committee analyzes each application and pairs applicants with appropriate scholarships. Veterans, the children of veterans, and students attending historically Black colleges or universities may qualify for additional scholarship opportunities. This scholarship targets undergraduates who aspire to imbue their future students with a love of science and technology. Eligible applicants typically double major in early childhood education and a STEM-related field, such as biology or mathematics. The scholarship committee presents 55-70 awards each year, and scholarship amounts vary. The program also selects some students to receive additional funding if students agree to teach in underperforming schools for five or more years after they graduate.